After a few years of being a member of a small flying club that owned a Piper Archer, the idea of getting a bigger, faster airplane was bouncing around in my head. And I wasn’t the only one. One friend wanted something that could haul his growing family. Another wanted something faster. I was feeling the itch too. 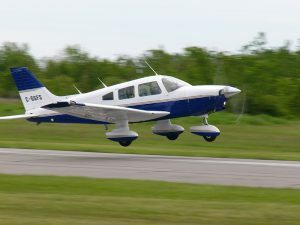 I’d gotten a taste of higher performance flying while working on my commercial certificate in a Socata Trinidad, and ever since then, the Archer seemed a whole lot slower. We’d kicked around the idea of adding something bigger to our existing club, but most members weren’t that interested. Ultimately, a few of us decided to split off from the club to buy something of our own. This series focuses on some of the lessons learned along the way — I’ll update this blog post with links to the follow-ups as they come out. The first question we faced was what kind of airplane we should look for — there’s no shortage of options. 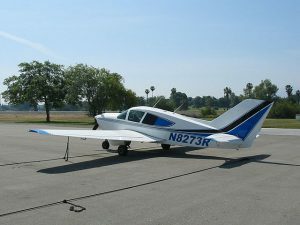 A quick glance at a major used airplane listing site like ASO.com or Barnstormers shows that there are scores of different makes and models available in most price ranges, from Cessnas to Citabrias to Cirruses. When you’re looking to step up from a trainer-class airplane (like a Piper Archer or a Cessna 172), the big questions you need to ask are what your typical mission looks like, and what the practical considerations are. Obviously, more capable plans require more capable budgets, and buying something that fits 85% of your needs is probably the smart way to go. For us, we needed more useful load, not necessarily more seats. In other words, a four-place plane was fine, but it had to actually be capable of hauling four adults. And it had to do it a little faster than the Archer. The practical considerations were budget, of course, as well as things like whether we wanted to delve into the world of a retract. High performance (defined by the FAA as having greater than 200 horsepower) was basically guaranteed given our mission. When it comes to buying an airplane, brand matters. Your aviation dollar goes a lot further when buying something like a Bellanca Super Viking than a Cessna 182 of the same vintage. The market clearly values popular airframes that are still in production — the upside is that anyone can work on a 182, but you pay more for that privilege. It’s up to you to weigh which of those things matter more, although I’ll say that you can get some really outstanding deals on phenomenal airplanes by looking outside Cessnas, Pipers, and Cirri. Initially, I was all for a complex plane. But because we were a pretty diverse group in terms of flying experience, it made sense to stick with fixed gear. Not only did that mean lower ongoing maintenance costs (no gear system to break), but it also meant much, much lower insurance premiums. Gear up landings remain a huge perceived risk to insurers. At first, we started looking closely at the Piper Dakota — the high-performance version of the Piper Archer that we’d all had plenty of experience flying. The Dakota is a great airplane. It’s got a great useful load, and it’s not that different from the Archer we’d all been partners in. But ultimately, our attention started swaying to its primary rival, the Cessna 182. 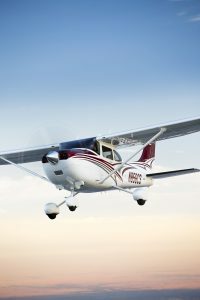 Cessna’s 182 Skylane is one of the most popular aircraft models ever built — it’s the high-performance step-up from the super popular Cessna 172 Skyhawk, and it’s nearly as ubiquitous, with more than 23,000 Cessna 182s built since 1956. It has a spacious cabin and hauls a ton, yet it only has four seats (which is great for insurance rates). It’s faster than a trainer, but it’s really not “fast” by any stretch of the imagination. It’s pricey, but parts are plentiful and any mechanic knows how to work on one. For all of those reasons (and more), many operators consider it the perfect airplane — and we ultimately decided we were in that group too. Aerial photography of the Textron Cessna 182 Skylane south of Wichita, KS. Image courtesy of Textron Aviation. From that decision, price helped inform a lot of the more nuanced decisions — like model year. But we came into the search with a pretty good idea of the kind of avionics and equipment we wanted in the plane. The Archer in the club we were leaving was very well equipped, with a WAAS GPS and all the accoutrements you’d need to fly in the modern system. That was a must — we didn’t want to downgrade our avionics to upgrade the airplane. So, that’s how our search started. In the next installment, I’ll tell you about the lessons learned in finding the airplane, getting inspections, and structuring our purchase with an LLC. As a new fanatic of airplanes, I was unaware that having a fixed gear would lower insurance premiums and have a lower maintenance cost. I’m still trying to save up for a plane of my own, so taking into consideration of other costs is extremely helpful. Is this so exciting!